Edinburgh, the most beautiful city on Earth, has affectionately been given the somewhat misleading moniker, ‘Auld Reekie’ which is Scots for ‘Old Smokey’. When tenements were heated with coal and wood fires the smoke would fill the silvery air. Nowadays the air is clean and crisp and particularly sweet-smelling in spring. Spring is a glorious time in Edinburgh and when I miss the city the most. The days become longer than their short wintertime counterparts and drier than their summertime counterparts. Springtime afternoons are typically sunny and warm up after brisk, cool mornings. This splendid time of year is the best time to see Edinburgh and its many, many charms. Edinburgh is a city full of Medieval and Georgian architectural treasures, cultural significance, historical importance, and is considered to be one of the most picturesque cities in all of Europe. In my opinion, this gorgeous city couldn’t be more stunning than in spring. 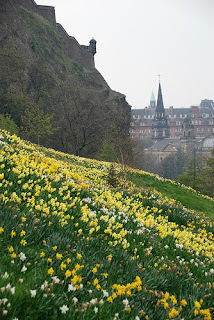 Mid-March is when the fields of daffodils bloom along the hillside overlooking Princes Street, Edinburgh’s famous artery that separates Old Town and New Town, and lead up to the extraordinary Edinburgh Castle. The green hillside is dotted with the most beautiful flecks of yellow and enjoyed by onlookers; some popping in and out the many shops that line the street, others enjoying the flora of Princes Street Gardens, a public park that runs south of Princes Street and sits in the shadow of the magnificent castle. The sound of birds return to floral scented springtime air. Fresh and in-season rhubarb, leek, kale, spring lamb and wild trout grace tables around the city. Inventive preparation of seasonal ingredients contributes to the chic culinary scene that is exploding in this tasty capital. University of Edinburgh students stroll George Square with a look of hopeful excitement as the end of the school year nears. The famous rhododendrons of the Royal Botanic Garden burst into color. Woolly newborn lambs and their flocks dot the green Scottish countryside. Residents emerge from the bygone short, cold winter days. Warm weather clothing surfaces from the wardrobe in hopes of rising temperatures. Spring in Edinburgh is hopeful, beautiful, and inspiring. There is an old song called I Love Paris in the Springtime, but as far as I’m concerned Paris doesn’t have anything on my dear Auld Reekie. As Robert Louis Stevenson said, ‘Edinburgh is what Paris ought to be.’ If you know me, you know I love Paris but Edinburgh is unquestionably more beautiful and with far fewer pretentions. Spring has sprung and those fortunate enough to be in Edinburgh this time of year indulge in a feast for the senses. What a beautiful and inspiring post. Spring is the most refreshing time of the year...and I too love Paris in the springtime but now I crave a visit to your beloved Edinburgh. A Day in Buenos Aires- Que Rico!